New English File: Are you lost in the world like me? One of the great paradoxes of our time is that we have never been more connected but we have never been more disconnected. 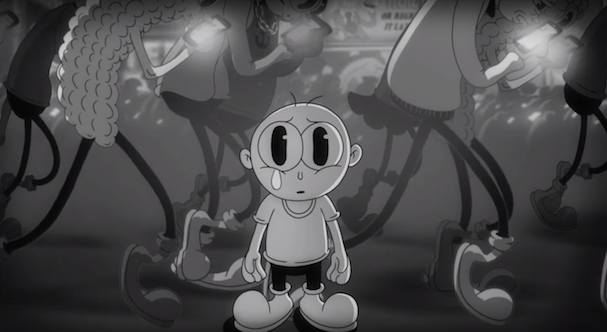 This animated black-and-white video was created by Steven Cutts in the style of 1920's. In it, a wide-eyed child roams through a world full of automatons who do nothing but stare at their smartphones. It makes us wonder about navigating life in our tech-obsessed, postmodern world. Watch at the video and get your own ideas. In your opinion, why is the video called Are you lost in the world like me? Explain. At the beginning of the video you can see a billboard which reads: These systems are failing. What is failing? Explain. People snap selfies all around. What happens when a baby is born? What do the people do when a woman attemps suicide? A man is beaten by the police without any apparent reason, what is the people reaction? A family eats together. What are they doing while eating? There's a beautiful woman taking herself a selfie, what can you see at her background? Do you think there is an impersonal connection between people? Why? Does social media and dating apps contribute to this? Why? In your opinion, is there an increasing dependence on technology today? Explain. Is technology changing us? Why? Why not? Are we becoming desensitized? Explain. In your opinion, is our society like a city on a hill? Express your final idea about the video.